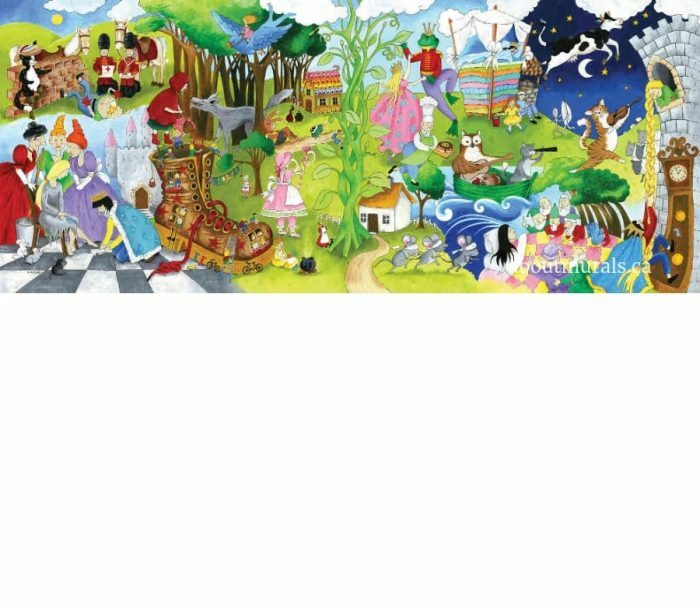 Story time wall mural is perfect for all kids who love to read books (or love being read to). 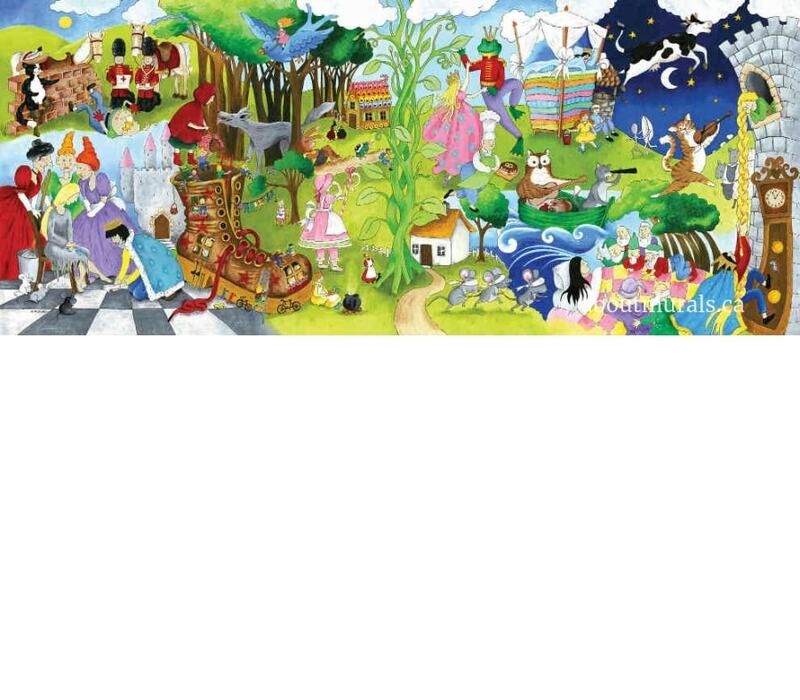 It includes characters from the most well-known fairy tales like Cinderella, Snow White and the Seven Dwarfs, Rapunzel, Jack and the Beanstalk, Little Red Riding Hood, Humpty Dumpty, Three Blind Mice, Hansel and Gretel, Princess and the Pea and so many more. It’s an original watercolor painting of turned into a removable wallpaper using a high-resolution scanner. You’ll see all the paint brush strokes and texture in the paper, making this fairytales scene look like a real painting on your wall. You’ll love curling up with your kids for storytime under this mural! Easy to hang. You just need a couple hours to hang this pre-pasted wallpaper. NO messing around with wallpaper glue, double cutting seams or “booking” the wallpaper. Removable. No damaged walls. No gels or scary tools needed. Just pull off. Super high quality with crystal clear images and thick, durable paper. No ripping while hanging and you’ll have to touch it to believe it’s not real. Reusable. Think you might move? Pull it off and take it with you! Washable. Finger prints? Food? No probs. Just wipe and it’ll look brand new. Eco-Friendly so it’s safe to use in any room – even a baby’s nursery. There are no VOCs or dangerous chemicals in the toner and they’re fully recyclable when you’re ready for a new design. Wall murals and samples are shipped free within Canada and the Contiguous United States! Yay! You’ll get your wall mural within 1-6 business days in Canada and 3-7 business days in the United States. Watch your mailbox for your sample – it’ll arrive in 7-10 business days within Canada and the Contiguous United States. Custom murals will ship within 2 weeks of final approval. How About Alaska and Hawaii? There is a flat-rate shipping fee of $29 to ship wall murals and samples to Alaska and Hawaii. The fee will automatically appear (like magic) after you add your address to the cart. You’ll get your mural within 3-7 business days in the United States. Watch your mailbox for your sample – it’ll arrive in 7-10 business days within Alaska and Hawaii. How About The UK, Europe and Australia? There is a flat-rate shipping fee of $99 to ship wall murals and samples to the UK, Ireland, Australia and New Zealand. The fee will automatically appear (presto!) after you add your address to the cart. You’ll get your mural and/or samples in about 15 days after ordering. But how do I hang my wallpaper? It must be hard! Here’s a little video to teach you how to hang your pre-pasted wallpaper mural! I made sure these wall murals were super easy to hang so my DIYers would be happier than Jillian Harris with a new vegan recipe to try. Each wallpaper panel is only 18″ wide so you only need one person to hang them (unless you enjoy arguing with your hubby). It’s pre-pasted so you don’t have to muck around with applying glue to the wall or the back of the wallpaper. Can you say messy? Once the mural panel is wet, you have up to 5 minutes to slip-and-slide it around on the wall making it super easy to line up the patterns. You don’t have to worry about the scary processes called booking or double cutting the seams. Google them…eek! I get it! You’d rather read your new book or colour with your kids. That’s why I offer wallpaper hanging services within Southern Ontario. If you’re not in Southern Ontario, check out the Wallcovering Installers Association to find someone in your area who can hang pre-pasted wallpaper. Feeling a little nervous about wallpaper? Worried it’ll be horrid to take down later? Concerned it’ll ruin your walls underneath? All of my wallpaper murals are totally REMOVABLE (yay!). Seriously, when you’re ready for a change, just pull the panels up and off the wall. It comes down in minutes with no damage to your walls. You can even re-use the wallpaper, so pack it up if you move or gift it to friends or a charity. I made you a how-to video so you can see how to remove it! Grab your popcorn and enjoy! What if I don’t like my mural? What if I change my mind? This wall mural can be returned within 30 days, for any reason, as long as it’s in its original package and the mural is intact (unused and uncut). You’ll have to cover the shipping costs to send it back. Cool? Custom printed murals and samples are non-refundable. Sorry! But you’re a pretty understanding person, right? Get a Sample for $1. Join My Newsletter! Everything was fabulous from the beginning to the end! My son loved his mural and we couldn't believe how great his Blue Jay symbol looked on his newly painted wall! I'd call About Murals again and I've recommend this company to friends and family. I felt so comfortable that I was away for the day while my son's wall was being painted! So happy! Adrienne was amazing. Her attention to detail is second to none and her professionalism cannot be matched. Our 3-D treehouse mural turned out better than my expectations and will provide so many memories for our three daughters over the coming years. We are so happy that she was able to create this special space for our family - and we look forward to decorating our 'tree' throughout the changing seasons! Thank you so much to About Murals for this creative addition to our home! From my first inquiry to the final finish, Adrienne was so helpful. The Mural arrived quickly to Australia and was easy to install. The final result looks fantastic. My son loves his room now. Thankyou Adrienne. We absolutely love our mural! We couldn't have asked for better customer service, too. It was easy to reach Adrienne, and anytime I needed to ask her a question, if she wasn't immediately available, she got back to us in a timely manner. We wanted our mural, which was in color, to be printed in black and white, and Adrienne said it was no problem to do so. She followed up with us to make sure we received our shipment without problems, and called at a later date to see how the installation went. Putting up the mural was easy, and watching the installation video helped greatly. I would highly recommend Adrienne and About Murals for anyone interested in adding a unique focal point or accent to their home. Save an extra 15% on all Wallpaper Murals!